A world of natural and artificial wonders is hidden underground Macedonia region, Greece. 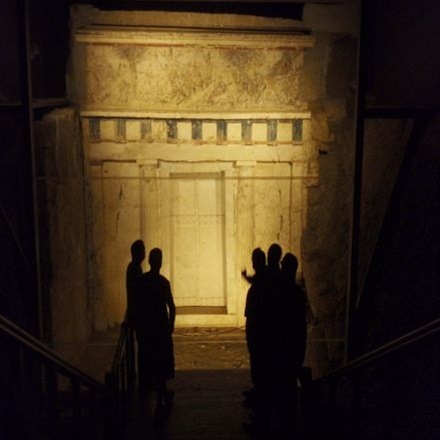 Underneath the peaceful village of Vergina, a sense of awe in the face of death, the splendours of regal glory, the emotions stirred by the tragic finale of the royal house of the Temenides, are all associated with the site of the royal tombs at Aigai. The amazing collection of the treasure is exhibited next to the tombs of King Phillip II – father of Alexander the Great – and his family. In the heart of Mount Belles in Serres, the WWII revives moments of a glorious history. The Roupel Bunker was part of the defensive Metaxas Line that was built in the 1930s to repel an invasion into Greece from Bulgaria. For three days the fort held out against German attack and was only abandoned by its men after the surrender of the Greek army in Thessaloniki. Today one of the fortification's galleries is open to visitors, as is a small museum and the pavilion the visitors, the observatory and memorial of fallen soldiers. n 1959 a villager of Petralona, in Halkidiki, Northern Greece, in his effort to find sources of water for the needs of the settlement, found a small cleft on the slopes of Mount Katsika. Two adventurous young men were lowered by rope to a depth of 13 meters and when they surfaced, they described the beautiful formations of stalactites and stalagmites. In 1960 Dr. Aris Poulianos found a complete skull and part of the skeleton of an erect hominid. The skull is dated as being 700.000 years old and the traces of fire found next to it, around 1.000.000 years old. It is considered one of the earliest human findings in Europe. The secret underneath St Demetrios church is a crypt where Thessaloniki’s patron saint was martyred. According both to tradition and to archaeological findings, it was an old bathhouse, in which Demetrios was imprisoned and eventually martyred in ad 303. In the 5th century, when the first Church of St Demetrios was built, the site of his martyrdom was incorporated into the church and the fountain was converted into a source of holy water. In the years that followed, the fountain acquired basins, from which the faithful could collect myron, the sweet-smelling oil produced by the saint’s relics. Doucas Tours and Travel reveals the underground civilization by organizing a 6days tour program in and around Thessaloniki.